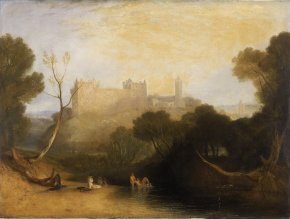 London, The National Gallery, from 14 March to 5 June 2012. The trend in double exhibitions, even sometimes triple  is becoming a bit wearisome. It appears easier - but is this really true ? - to attract crowds using two famous names instead of one, regardless of the actual artistic value of the comparison. Either the two artists have nothing in common, resulting in an exhibition of dubious interest for art history (this was, for the most part, the case of Rembrandt-Caravaggio - see article in French), or the connection is so obvious that it makes it difficult to offer anything original or not yet published already. As always at the National Gallery, the hang is perfect. However, this is not enough to mask the emptiness of the show’s purpose, largely confirmed by the catalog which is made up of beautiful images accompanied by terse entries and only three short essays, including one (on the Turner bequest to the National Gallery) which seems to have been tacked on in an artificial way to the others (but fills up one of the rooms in the show...). Yes, Claude fascinated Turner who copied, pastiched and then reinterpreted his work. But this first-year art history fact which even the catalog qualifies, correctly, as cliché, could have been treated in a special-study exhibition and there was in fact no need to accord it all this space. This is especially true given that the comparison between the two painters turns sour for the second who, in certain paintings, appears as far inferior to the older master. Turner can be a genius, but he is often uneven in quality, at times even frankly average. Finally, it is unfortunate that the National Gallery did not make the choice of treating Claude’s influence on English landscape painting, a more extensive subject which would have limited the number of works by Turner (many of which are visible anyway at the Tate Gallery on a permanent basis) and presented for example, canvases by Richard Wilson which the catalog simply evokes, telling us that he influenced Turner by "suggesting ways in which Claude’s ordering of a scene could be transplanted to a British setting". 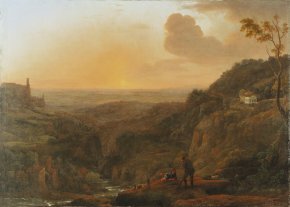 The importance of Claude for England obviously inspired British landscape painting and it would have been interesting to study this aspect. The subject could have even included the art of gardens, a theme which is approached only briefly in the catalog, with notably the figure of Capability Brown who also looked closely at Claude. The Grand Palais, after the Tate, had done an excellent job of offering an in-depth show on a similar subject, not limiting itself to examining Claude’s influence on Turner, resulting in a fascinating exhibition (see article in French). We have become used to exhibitions of such high quality at this London museum that the double retrospective on Claude Lorrain and J.M.W. Turner is perhaps more disappointing than it should be, since there is nothing actually dishonorable about it. Simply put, visitors will find it boring, once again confirming the exception that proves the rule. Collective work, Turner Inspired : In the Light of Claude, 2012, National Gallery Company, 144 p., £25. ISBN : 9781857095371. Visitor information : The National Gallery, Trafalgar Square, London WC2N 5DN. Tel : +44 (0) 20 7747 2885. Open every day from 10 a.m. to 6 p.m., Fridays until 9 p.m. To reserve or buy tickets, go to the National Gallery website.